Kraków (Krakow) is one of the largest and oldest cities in Poland, with the urban population of 756,441 (2008). Situated on the Vistula river (Polish: Wisła) in the Lesser Poland region, the city dates back to the 7th century. It was the capital of Poland from 1038 to 1596, the capital of the Grand Duchy of Kraków from 1846 to 1918, and the capital of Kraków Voivodeship from the 14th century to 1999. It is now the capital of the Lesser Poland Voivodeship. The earliest known settlement on the present site of Kraków was established on Wawel Hill, and dates back to the 4th century. Legend attributes the town's establishment to the mythical ruler Krakus, who built it above a cave occupied by a ravenous dragon, Smok Wawelski. Many knights unsuccessfully attempted to oust the dragon by force, but instead, Krakus fed it a poisoned lamb, which killed the dragon. The city was free to flourish. Dragon bones, most likely that of mammoth, are displayed at the entrance of the Wawel Cathedral. Before the Polish state had been formed, Kraków was the capital of the tribe of Vistulans, subjugated for a short period by Great Moravia. After Great Moravia was destroyed by the Hungarians, Kraków became part of the kingdom of Bohemia. The first appearance of the city's name in historical records dates back to 966, when a Sephardi Jewish traveller, Abraham ben Jacob, described Kraków as a notable commercial centre under the rule of the then duke of Bohemia (Boleslaus I the Cruel). He also mentioned the baptism of Prince Mieszko I and his status as the first historical ruler of Poland. Towards the end of his reign, Mieszko took Kraków from the Bohemians and incorporated it into the holdings of the Piast dynasty. By the end of the 10th century, the city was a leading center of trade. Brick buildings were being constructed, including the Royal Wawel Castle with the Rotunda of Sts. Felix and Adauctus, Romanesque churches, a cathedral, and a basilica. Sometime after 1042, Casimir I the Restorer made Kraków the seat of the Polish government. In 1079 on a hillock in nearby Skałka, the Bishop of Kraków, Saint Stanislaus of Szczepanów, was slain by the order of the Polish king Bolesław II the Generous. In 1138, the Testament of Bolesław III Wrymouth came into effect upon his death. It divided Poland into five provinces, with Kraków named as the Seniorate Province, meant to be ruled by the eldest male member of the royal family as the High Duke. Infighting among brothers, however, caused the seniorate system to soon collapse, and a century-long struggle between Bolesław's descendants followed. The fragmentation of Poland lasted until 1320. Kraków was almost entirely destroyed during the Mongol invasion of Poland in 1241, after the Polish attempt to repulse the invaders had been crushed in the Battle of Chmielnik. Kraków was rebuilt in 1257, in a form which was practically unaltered, and received self-government city rights from the king based on the Magdeburg Law. In 1259, the city was again ravaged by the Mongols, 18 years after the first raid. A third attack, though unsuccessful, followed in 1287. The year 1311 saw the Rebellion of wójt Albert against Polish High Duke Władysław I. It involved mostly German-speaking citizens of Kraków who, as a result, abandoned their political ambitions. However, the rebellion cost Poland the city of Gdańsk (Danzig), which was taken over by the Teutonic Order in 1309. Medieval Kraków was surrounded by a 1.9 mile (3 km) defensive wall complete with 46 towers and seven main entrances leading through them (see St. Florian's Gate and Kraków Barbican). The fortifications were erected over the course of two centuries. The town defensive system appeared in Kraków after the city's location, i.e. in the second half of the 13th century (1257). This was when the construction of a uniform fortification line was commenced, but it seems the project could not be completed. Afterwards the walls, however, were extended and reinforced (a permit from Leszek Biały to encircle the city with high defensive walls was granted in 1285). Kraków rose to new prominence in 1364, when Casimir III of Poland founded the Cracow Academy, the second university in central Europe after the University of Prague. There had already been a cathedral school since 1150 functioning under the auspices of the city's bishop. The city continued to grow under the joint Lithuanian-Polish Jagiellon dynasty (1386–1572). As the capital of a powerful state, it became a flourishing center of science and the arts. Kraków was a member of the Hanseatic League and many craftsmen settled there, established businesses and formed craftsmen's guilds. City Law, including guilds' depictions and descriptions, were recorded in the German language Balthasar Behem Codex. This codex is now featured at the Jagiellonian Library. By the end of the thirteenth century, Kraków had become a predominantly German city. In 1475 delegates of the elector George the Rich of Bavaria came to Kraków to negotiate the marriage of Princess Jadwiga of Poland (Hedwig in German), the daughter of King Casimir IV Jagiellon to George the Rich. Jadwiga traveled for two months to Landshut in Bavaria, where an elaborate marriage celebration, the Landshut Wedding (Landshuter Hochzeit 1475) took place in St. Martin's church (Landshut). 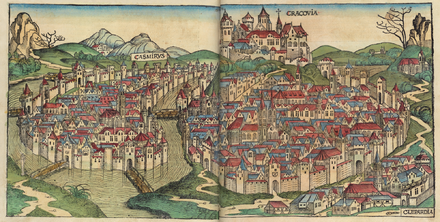 Around 1502 Kraków was already featured in the works of Albrecht Dürer as well as in those of Hartmann Schedel (Nuremberg Chronicle) and Georg Braun (Civitates orbis terrarum). In the adjoining Jewish quarter of Kazimierz, earmarked in 1495 by King Jan I Olbracht for the Jewish community after a fire, some of Europe's oldest synagogues were built. The most prominent of them, the Old Synagogue, now serves as a Jewish history museum. The Renaissance, whose influence originated in Italy, arrived in Kraków in the late 15th century, along with numerous Italian artists including Francesco Fiorentino, Bartolommeo Berrecci, Santi Gucci, Mateo Gucci, Bernardo Morando, and Giovanni Baptista di Quadro. The period, which elevated the intellectual pursuits, produced many outstanding artists and scientists such as Nicolaus Copernicus who studied at the local Academy. In 1468 the Italian humanist Filip Callimachus came to Kraków, where he worked as the teacher of the children of Casimir IV Jagiellon. In 1488 the imperial Poet Laureate and humanist Conrad Celtes founded the Sodalitas Litterarum Vistulana ("Literary Society on the Vistula"), a learned society based on the Roman Academies. In 1489, sculptor Veit Stoss (Wit Stwosz) of Nuremberg finished his work on the high altar of St. Mary's Church. He later made a marble sarcophagus for his benefactor Casimir IV Jagiellon. By 1500, Johann Haller had established a printing press in the city. Many works of the Renaissance movement were printed there during that time. Art and architecture flourished under the watchful eye of King Sigismund I the Old, who ascended to the throne in 1507. He married Bona Sforza of a leading Italian family and using his new Italian connections began the major project (under Florentine architect Berrecci) of remaking the ancient residence of the Polish kings, the Wawel Castle, into a modern Renaissance palace. In 1520, Hans Behem made the largest church bell, named the Sigismund Bell after King Sigismund I. At the same time Hans Dürer, younger brother of Albrecht Dürer, was Sigismund's court painter. Around 1511 Hans von Kulmbach painted a series of panels for the Church of the Pauline Fathers at Skałka and the Church of St. Mary. Sigismund I also brought in Italian chefs who introduced Italian cuisine. In 1572, King Sigismund II died childless, and the throne passed briefly to Henry of Valois, then to Sigismund II's sister Anna Jagiellon and her husband Stephen Báthory, and then to Sigismund III of the Swedish House of Vasa. His reign changed Kraków dramatically, as he moved the government to Warsaw in 1596. A series of wars ensued between Sweden and Poland. In the late 18th century, the Polish–Lithuanian Commonwealth was partitioned three times by its expansionist neighbors: Imperial Russia, the Austrian Empire, and the Kingdom of Prussia. After the first two partitions (1772 and 1793), Kraków was still part of the substantially reduced Polish nation. In 1794 Tadeusz Kościuszko initiated a revolt against the partitioning powers, the Kościuszko Uprising, in Kraków's market square. The Polish army, including many peasants, fought against the Russian and Prussian armies, but the larger forces ultimately put down the revolt. The Prussian army specifically took Kraków on 15 June 1794, and looted the Polish royal treasure kept at Wawel Castle. The stolen regalia, valued at 525,259 thalers, was secretly melted down in March 1809, while precious stones and pearls were appropriated in Berlin. Poland was partitioned for the third time in 1795, and Kraków became part of the Austrian province of Galicia. When Napoleon Bonaparte of the French Empire captured part of what had once been Poland, he established the Duchy of Warsaw (1807) as an independent but subordinate state. West Galicia, including Kraków, was taken from the Austrian Empire and added to the Duchy of Warsaw in 1809 by the Treaty of Schönbrunn, which ended the War of the Fifth Coalition. The Congress of Vienna (1815) restored the partition of Poland, but gave Kraków partial independence as the Free City of Cracow. The city again became the focus of a struggle for national sovereignty in 1846, during the Kraków Uprising. The uprising failed to spread outside the city to other Polish lands, and was put down, resulting in the creation of the Grand Duchy of Cracow within the Austrian Empire. In 1850 10% of the city was destroyed in the large fire. After the Austro-Prussian War of 1866, Austria granted partial autonomy to Galicia, making Polish a language of government and establishing a provincial Diet. As this form of Austrian rule was more benevolent than that exercised by Russia and Prussia, Kraków became a Polish national symbol and a center of culture and art, known frequently as the "Polish Athens" (Polskie Ateny) or "Polish Mecca" to which Poles would flock to revere the symbols and monuments of Kraków's (and Poland's) great past. Several important commemorations took place in Kraków during the period from 1866–1914, including the 500th Anniversary of the Battle of Grunwald in 1910, in which world-renowned pianist Ignacy Paderewski unveiled a monument. Famous painters, poets and writers of this period, living and working in the city include Jan Matejko, Stanisław Ignacy Witkiewicz, Jan Kasprowicz, Juliusz Kossak, Wojciech Kossak, Stanisław Wyspiański and Stanisław Przybyszewski. The latter two were leaders of Polish modernism. The Fin de siècle Kraków, even under the partitions, was famously the center of Polish national revival and culture, but the city was also becoming a modern metropolis during this period. In 1901 the city installed running water and witnessed the introduction of its first electric streetcars. (Warsaw's first electric streetcars came in 1907.) The most significant political and economic development of the first decade of the 20th century in Kraków was the creation of Greater Kraków (Wielki Kraków), the incorporation of the surrounding suburban communities into a single administrative unit. The incorporation was overseen by Juliusz Leo, the city's energetic mayor from 1904 to his death in 1918 (see also: the Mayors of Kraków). Thanks to migration from the countryside and the fruits of incorporation from 1910 to 1915, Kraków's population doubled in just fifteen years, from approx. 91,000 to 183,000 in 1915. Russian troops besieged Kraków during the first winter of the First World War, and thousands of residents left the city for Moravia and other safer locales, generally returning in the spring and summer of 1915. During the war Polish Legions led by Józef Piłsudski set out to fight for the liberation of Poland, in alliance with Austrian and German troops. The Austro-Hungarian and German Empires lost the war, but the terms of the Treaty of Versailles (1919) established the first sovereign Polish state in over a century. Between the two World Wars Kraków was also a major Jewish cultural and religious center (see: Synagogues of Kraków), with the Zionist movement relatively strong among the city's Jewish population. Jews being marched out of the city by armed German SS guards during liquidation of the Kraków Ghetto, 1943. Poland was partitioned again at the onset of the Second World War. The Nazi German forces entered Kraków on September 6, 1939. The residents of the city were saved from German attack by the courageous Mayor Stanisław Klimecki who went to meet the invading Wehrmacht troops. He approached them with the call to stop shooting because the city was defenseless: "Feuer einstellen!" and offered himself as a hostage. He was killed by the Gestapo three years later in the Niepołomice Forest. Kraków became the capital of the General Government, a colonial authority under the leadership of Hans Frank. The occupation took a heavy toll, particularly on the city's cultural heritage. First, during the infamous Sonderaktion Krakau 184 professors and academics of the Jagiellonian University (including Rector Tadeusz Lehr-Spławiński among others) were arrested at the Collegium Novum during a meeting ordered by the Gestapo chief SS-Obersturmbannführer Bruno Müller. President of Kraków, Klimecki was apprehended at his home the same evening. After two weeks, they were sent to Sachsenhausen concentration camp on the other side of Berlin, and in March 1940 further to Dachau. Those who survived were released only after international protest involving the Vatican. Many relics and monuments of national culture were looted and destroyed (yet again), including the bronze statue of Adam Mickiewicz stolen for scrap. The Jewish population was first ghettoized, and later murdered. Two major concentration camps near Kraków included Płaszów and the extermination camp of Auschwitz, to which many local Poles and Polish Jews were sent. Specific events surrounding the Jewish ghetto in Kraków and the nearby concentration camps were famously portrayed in the film Schindler's List, itself based on a book by Thomas Keneally entitled Schindler's Ark. A common account popularized in the Soviet-controlled communist People's Republic of Poland, held that due to a rapid advance of the Soviet armies, Kraków allegedly escaped planned destruction during the German withdrawal. There are several different versions of that account. According to a version based on self-written Soviet statements, Marshal Ivan Konev claimed to have been informed by the Polish patriots of the German plan, and took an effort to preserve Kraków from destruction by ordering a lightning attack on the city while deliberately not cutting the Germans from the only withdrawal path, and by not aiding the attack with aviation and artillery. The credibility of those accounts has been questioned by Polish historian Andrzej Chwalba who finds no physical evidence of the German master plan for demolition and no written proof showing that Konev ordered the attack with the intention of preserving the city. He portrays Konev's strategy as ordinary – only accidentally resulting in little damage to Kraków – exaggerated later into a myth of "Konev, savior of Kraków" by Soviet propaganda. The Red Army entry into the city was accompanied by a wave of rapes of women and girls resulting in official protests. After the war, the government of the People's Republic of Poland ordered the construction of the country's largest steel mill in the suburb of Nowa Huta. This was regarded by some as an attempt to diminish the influence of Kraków's intellectual and artistic heritage by industrialization of the city and by attracting to it the new working class. The city is regarded by many to be the cultural capital of Poland. In 1978, UNESCO placed Kraków on the list of World Heritage Sites. In the same year, on October 16, 1978, Kraków's archbishop, Karol Wojtyła, was elevated to the papacy as John Paul II, the first non-Italian pope in 455 years. Kraków's population has quadrupled since the end of World War II. After the collapse of the Soviet empire and the subsequent joining of the European Union, Offshoring of IT work from other nations has become important to the economy of Kraków and Poland in general in recent years. The city is the key center for this kind of business activity. There are about 20 large multinational companies in Kraków, including centers serving IBM, General Electric, Motorola, and Sabre Holdings, along with British and German-based firms. ^ Central Statistical Office, Warsaw 2008, "Population. Size and Structure by Territorial Division, as of June 30, 2008". Archived from the original (PDF) on April 13, 2009. Retrieved 2009-05-16. ^ a b The Municipality Of Kraków Press Office, 1996–2007, in participation with ACK Cyfronet of the AGH University of Science and Technology, "Our City. History of Krakow, archaeological findings". Archived from the original on 2007-02-19. Retrieved 2007-09-11. ^ Wawel Royal Castle, homepage. Maria Dębicka, "The Dragon's Den". Archived from the original on 2007-04-22. Retrieved 2007-09-11. ^ Charles Cawley, Poland. Mieszko I, 966-992. Medieval Lands Project, 2006. Cite #51: Dzięcioł, Witold (1963) The Origins of Poland (Veritas, London), p. 148. Accessed 17 March 2011. ^ Francis W. Carter (1994). Trade and urban development in Poland: an economic geography of Cracow. Cambridge University Press. p. 71. ISBN 0-521-41239-0. Retrieved May 19, 2011. ^ Krystyna Van Dongen (née Wyskwarska) and Frank Van Dongen, "The royal castle". Archived from the original on 2011-07-24. Retrieved 2007-05-12. ^ Marek Żukow-Karczewski, "The Barbican", Kraków Magazyn Kulturalny (Special Edition), Kraków, 1991, p. 58-59. ^ Zamoyski, Adam (2015). Poland. A History. William Collins. p. 26. ISBN 978-0007556212. ^ "Krakow Jews History". World Holocaust Forum. The International Foundation for the Commemoration of the Holocaust and its Victims. Retrieved 12 May 2007. ^ Marek Strzala. "Important Dates in Krakow's History: Veit Stoss altarpiece for Krakow's Basilica of Virgin Mary". Retrieved 12 May 2007. ^ Haldane Macfall, A History of Painting Published by Kessinger Publishing. Page 113. ^ "Poland - The Commonwealth | history - geography". Encyclopedia Britannica. Retrieved 2017-03-16. ^ Monika Kuhnke. "Rabunek od czasów zaborów do II wojny światowej (The plunder during the Partitions and until World War II)". www.zabytki.pl (in Polish). Retrieved 2010-10-30. ^ Marek Strzala, "History of Krakow" "(see: Franz Joseph I granted Krakow the municipal government)". Retrieved 2007-05-12. ^ Bożena Szara (6 April 2001). "Między dwoma światami czyli powrót do przeszłości" [Between the two worlds, or a return to the past] (in Polish). Przegląd Polski. Archived from the original on July 23, 2011. Retrieved October 14, 2012. Search key: "polskie Ateny". ^ Mirosław Sikora (2008). "Zasady i praktyka przejęcia majątku polskiego przez III Rzeszę (Theory and practise of Poland's takeover by the Third Reich)" (PDF direct download: 1.64 MB). Bulletin PAMIĘĆ I SPRAWIEDLIWOŚĆ, No. 2 (13). Institute of National Remembrance, Poland. pp. 404&nbsp, (66, &nbsp, and&nbsp, 84). Retrieved May 8, 2012. [permanent dead link] Note: Please save a copy to your own hard drive without opening it, and run a virus check through that copy first if you're concerned with security. Source is reliable. ^ Franciszek Wasyl (November 1, 2011). "Krakowski etap "Sonderaktion Krakau". Wspomnienie Zygmunta Starachowicza" (in Polish). WordPress.com. Archived from the original on June 20, 2010. Retrieved May 8, 2012. ^ "Więźniowie Sonderaktion Krakau" (PDF 275 KB). Alma Mater No. 118. Jagiellonian University. Retrieved May 15, 2012. ^ Anna M. Cienciala, "The German Occupation of Poland and the Holocaust in German-occupied Poland." Chapter: "The Polish Resistance Movement against the Germans." The Polish Review, v.48, 1, 2003, 49-72. ^ Norman Salsitz, Stanley Kaish, Salsitz, Norman; Kaish, Stanley (2002-12-01). Three Homelands: Memories of a Jewish Life in Poland, Israel, and America. ISBN 978-0-8156-0734-2. Retrieved 2007-11-22. According to authors the Jewish-Polish secretary of the German M&K Construction Company, Amalie Petranker (hiding from the Nazis as Felicja Milaszewska), came into the possession of a set of plans that showed where explosives had been planted with the intention of destroying the city. The plans were found as soon as the German managers had fled Kraków. Notably, Petranker continued to live in the apartment previously occupied by the managers of M&K Construction on Juljusza Lea Street until receiving the government notice to vacate. ^ a b "The Germans planned to blow up Krakow, which has many medieval buildings and museums, but they were foiled when the map of mines and explosives placed around the city, was delivered by a couple of Polish citizens to the Russians, who were closing in on the city." Anna M. Cienciala, "The German Occupation of Poland and the Holocaust in German-occupied Poland." Chapter: "The Polish Resistance Movement against the Germans." The Polish Review, v.48, 1, 2003, 49-72. ^ (in Polish) Leszek Mazan, Ocalenie Krakowa, Polityka - nr 3 (2487) z dnia 22-01-2005. According to this article, Konev was ordered to save Kraków by Stalin, who was pressured by Roosevelt, who was in turn pressured by Vatican (acting on the requests of Polish clergy). ^ (in Polish) Alma Mater, Jagiellonian University monthly, No.64 (2004). Interview with professor Andrzej Chwalba, by Rita Pagacz-Moczarska. "OKUPOWANY KRAKÓW". Archived from the original on 2008-05-24. Retrieved 2007-09-11. ^ (in Polish) Andrzej Chwalba. Kraków w latach 1939-1945 Archived 2007-12-03 at the Wayback Machine (Cracow under German Occupation, 1939-1945). Dzieje Krakowa, volume 5. Kraków: Wydawnictwo Literackie, 2002. ^ Wide Angle: The Future of Outsourcing. (Section: Poland) Educational Broadcasting Corporation. Accessed 16 March 2011. ^ The Sabre Holings office at Krakow, Poland. Archived May 23, 2007, at the Wayback Machine Accessed 16 March 2011. 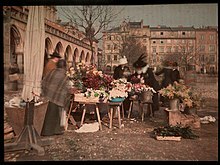 Wikimedia Commons has media related to History of Kraków. Europeana. Items related to Kraków, various dates. This page was last edited on 6 February 2019, at 21:49 (UTC).